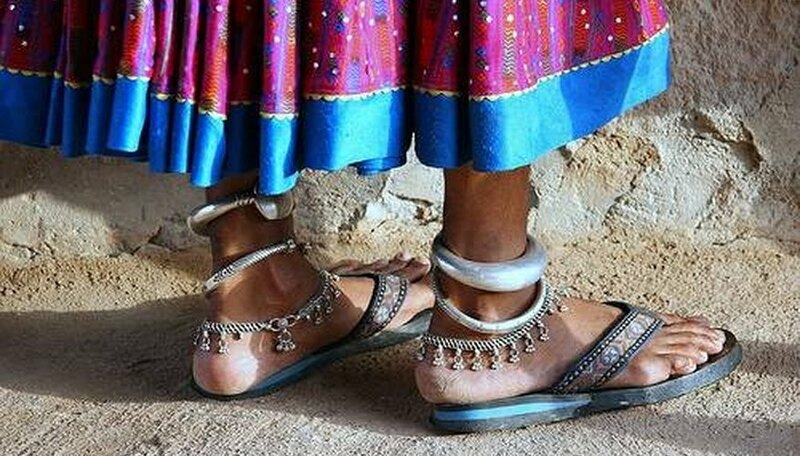 Ankle bracelets are loved and worn the world the over, and are also called ankle chains or anklets. Ankle bracelets can be simply made leather thongs or more detailed and expensive metal chains. Some scuba divers have even been known to wear lead ankle bracelets to keep their legs from floating up while diving. Making ankle bracelets is a craft project that you and your family can do together, or your kids can do by themselves. Choose the beads. Go to your local craft store or Wal-Mart and pick out some beads. Beads are made out of many different materials and shapes, such as wood, plastic, glass or metal and round or long beads. You can choose charms, too, for your ankle bracelet. Measure the elastic cord. Wrap some of the elastic cord around your wrist to measure how long to cut the cord. This may be an easier job if you have someone wrap it for you. The cord needs to be snug but not tight. Make sure to leave a long tail on each end for the knot. Cut the cord. Make a diagram. It sometimes helps if you have a bead diagram to go by when making a piece of beaded jewelry. This way, if you make a mistake or lose your place, you can look at the diagram and see where to start back at. One design is to add a big bead and then a small bead. Your only limit to the designs you could make is your imagination. Knot the cord. Take one end of the elastic cord and set a large enough knot on it to keep the beads from sliding off. Make the knot some what loose so you can undo it later if need be. String the beads. String the beads on the elastic cord in the order you decided on and wrote down on the diagram. When you have enough beads that they go all the way around your wrist and meet then tie the elastic cord together in a knot. If you have to, then unloosen the first knot. Cut the left over ends of cord and slide the beads until one covers the knot. An alternative to making an ankle bracelet is to get a tattoo of a bracelet around your ankle. You won't ever lose or break this ankle bracelet, but it will probably be more painful. Maryelser is a full time freelance writer. She specializes in cooking, gardening and crafts and has published numerous articles on eHow.com.